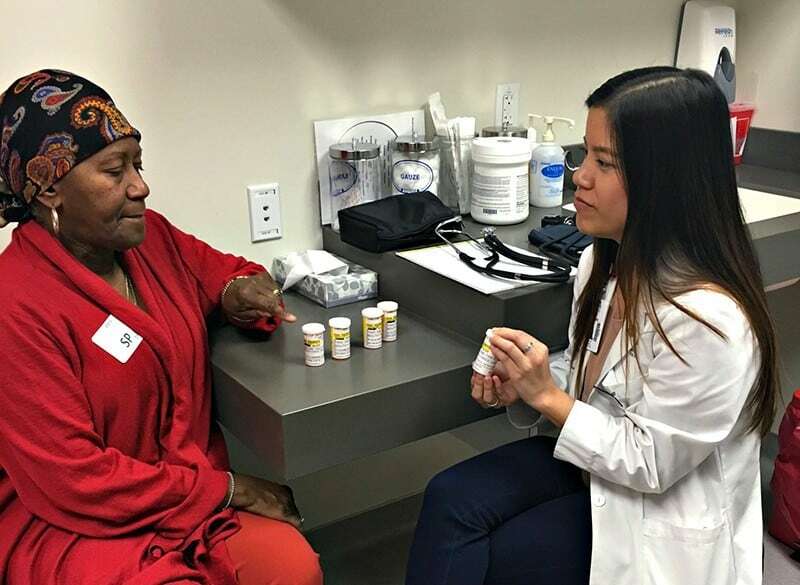 Standardized patient Betty Anderson talks about her medications with pharmacy student Jennifer Nguyen at the Pat and Willard Walker Student Clinical Education Center on UAMS’ northwest Arkansas campus in Fayetteville. March 4, 2016 | March 4, 2016 | It was a negative encounter with doctors that made Betty Anderson decide to do something about it 21 years ago. Now she hopes more northwest Arkansas residents will join her to give UAMS students a chance to learn better clinical skills through simulated patient experiences. 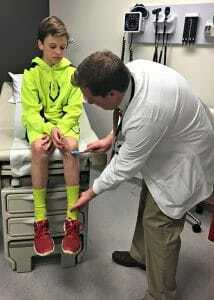 Third-year medical student Robert Garner checks the reflexes of standardized patient Luke Marble. Anderson and two other standardized patients, people who simulate the signs and symptoms of an actual patient in a clinical exercise, participated in a March 2 open house at the Pat and Willard Walker Student Clinical Education Center on UAMS’ northwest Arkansas campus in Fayetteville. The three demonstrated a medication consultation, a patient exam and a pediatric exam with UAMS students in an attempt to encourage more patient-actors to participate at the northwest campus. For the open house, Anderson portrayed a patient while College of Pharmacy student Jennifer Nguyen discussed medications with her. 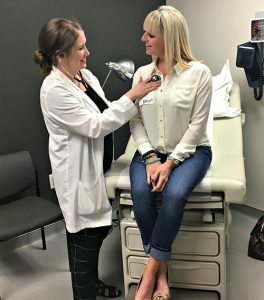 Students from UAMS medical, nursing, pharmacy and physical therapy programs on the regional campus all use the center to practice patient-centered clinical skills in a safe environment and receive feedback about their encounters. The encounters allow the students to strengthen clinical communication and physical exam skills. Advanced practice nursing student Ashley Moyer uses a stethoscope in an exam of standardized patient Many Gittins. UAMS wants to find more people like Mandy Gittins of Rogers, who during the open house portrayed a patient during an exam by Ashley Moyer, an advanced practice nursing student. “I am excited to be part of an organization that is dedicated to enriching the future of medical professionals,” Gittins said. Standardized patients are paid $15 per hour. More information, including an online application form, can be found at http://medicalsim.uams.edu/standardized-patients or contact the clinic manager at (479)713-8332. People with many different backgrounds can be employed as standardized patients, including school teachers, retired college professors, actors, medical technicians, retired businessmen, college students, accountants and homemakers. Some are hired specifically for their particular medical histories or real physical findings. The cases they portray are based on actual patient encounters experienced by physicians. Standardized patients are trained to provide feedback to the learners, especially in the area of interpersonal communication. Standardized patients receive complete training and coaching prior to working with students. This includes specific verbal and non-verbal behaviors appropriate for the role and instructions to help standardize the simulation for every student who sees them. “We want our standardized patients to feel comfortable with the scenario they are performing because we want their performances to be as consistent and realistic as possible,” said Mary Cantrell, executive director for the UAMS Centers for Simulation Education. The Walker Student Clinical Education Center opened in 2013 with six outpatient exam rooms fully equipped with audio and video capabilities. Multiple cameras capture different views of simulation exercises. A central observation room is dedicated for standardized patient training along with monitors and equipment to view each room’s encounter. There also is a clinical skills room with equipment that allows students to practice listening to heart sounds, suturing techniques, IV insertion and other simulated tasks.